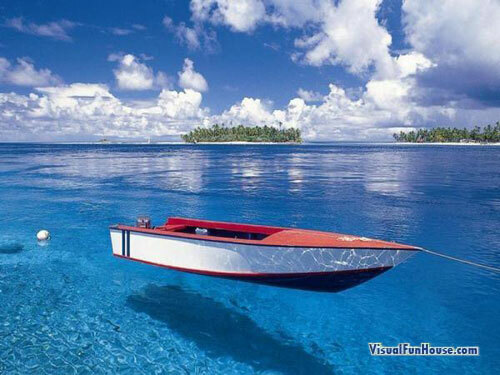 Floating Boat Optical Illusion is a very cool picture. The boat appears to be floating in thin air! Im sure we have all seen hover crafts but they generally ride on very small cousin of air and this little row boat sure inst packing a giant fan underneath! The trick here is the shadow, which is normally how you tell how far off the ground it is.. IS the shadow on top or underwater? Well on the topic of the sea be sure to check out this incredible Underwater Sculpture Park. this website is creeppyy yet coool!! that boat is not floating, it is sitting on the water and the shadow is at the bottom.